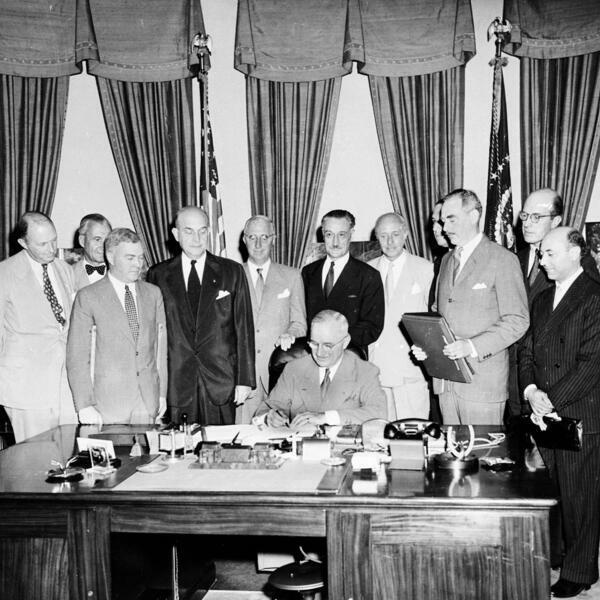 (Photo:The North Atlantic Treaty was signed by US President Harry S. Truman in Washington, on 4 April 1949 and was ratified by the United States in August 1949. Blaise Misztal is the director of BPC’s national security program. He previously served as the project’s associate director and senior policy analyst. At BPC, Misztal has researched a variety national security issues, including Iran and its nuclear program, Turkey, cybersecurity, stabilizing fragile states, and public diplomacy in the 21st century. Misztal wrote and directed the 2009 “Cyber ShockWave” simulation that aired on CNN. Prior to joining BPC, Misztal spent a year as a Nuffield Fellow at Nuffield College, Oxford University. He was selected as a future leader by the Foreign Policy Initiative in 2010 and named as a national security fellow by the Foundation for Defense of Democracies in 2011.